Elo Tablet The Elo® Tablet is designed to help retailers enhance their customer experience and drive sales efficiency through a point-of-service (POS) and point-of-information (POI) platform that is portable, intuitive, reliable and secure. Millions of real-life retail installations all over the world have helped Elo develop unique insight for this next generation of our touch computing innovation. Elo 1215L The 1215L touchmonitors are designed, developed and built to provide the most cost-effective touch solutions for system integrators and VARs. Aimed at the fast-changing retail POS and hospitality markets, they provide reliable, durable operation and come from the worldwide leader in touchmonitors. The space-saving 1215L features a choice of touch technologies and spill resistant sealing. Elo 1515L The 1515L touchmonitors are designed, developed and built to provide the most cost-effective touch solutions for system integrators and VARs. Aimed at the fast-changing retail POS and hospitality markets, they provide reliable, durable operation and come from the worldwide leader in touchmonitors, Elo Touch Solutions. Elo 1517L Rev A The 1517L zero-bezel touchmonitor is built to withstand the rigors of continuous public use with a rugged, “built for touch” industrial design. It delivers style and performance with a wide variety of features for a higher level of functionality. It is well suited for public venues where point-of-sale (POS), point-of-information (POI), point-of-service, shelf-level and countertop interactive digital signage, loyalty systems, kiosk information systems are found. Elo 1517L Rev B The 1517L touchmonitor is built to withstand the rigors of continuous public use with a rugged "built for touch" design. Its stylish, thin and modern look is coupled with a retail-focused feature set and is an attractive solution for commercial touchmonitor needs. It is well suited for high use public venues where point-of-sale, point-of-information, point-of-service, shelf-level and countertop interactive digital signage and loyalty systems are found. Elo 1522L The 1522L 15" LCD desktop touchmonitor offers the same sleek design as the 1529L 15" LCD desktop model, but is more cost effective for the end user. The optional 3-track magnetic stripe reader (MSR), programmable to either HID or Keyboard Emulation (USB only), is easily installed by the user, providing an elegant, integrated solution and eliminating the need for external brackets or attachments. Elo 1523L The Elo Touch Solutions 1523L 15-inch touchmonitor is well-suited to meet the durability and aesthetic requirements for a variety of high traffic retail and hospitality interactive solutions and includes options for 3-track Magnetic Stripe Reader (MSR), webcam, RFID reader and brackets for mounting a 0700L rear facing customer display. iTouch Plus zero-bezel multi-touch surface acoustic wave touchscreen technology provides stable "drift-free" operation with outstanding image clarity, resolution, and light transmission-for an accurate touch response and vivid images. iTouch Plus offers a unique, aesthetically-pleasing seamless design and is resistant to water, impacts, scratches and other contaminants on the screen. Elo 1529L The Elo 1529L touchmonitor expands the company's family of reliable, easily integrated, multifunction touch solutions. The retail-rugged 1529L includes options for a magnetic stripe reader (MSR). The 1529L has been designed for touch from the ground up, with such features as spill-resistant sealing, a short or tall stable tilt stand that is removable or reversible for wall mounting, connectivity incorporated within the monitor, and a choice of Elo touch technology as well as color. Elo 1715L The 1715L touchmonitor is designed, developed and built to provide the most cost-effective touch solutions for system integrators and VARs. It packs Elo quality and reliability into an integrated, affordable touchmonitor. The optional 3-track magnetic stripe reader (MSR), programmable to either HID or Keyboard Emulation (USB only), is easily installed by the user, providing an elegant, integrated solution and eliminating the need for external brackets or attachments. Elo 1717L The 1717L touchmonitor is built to withstand the rigors of continuous public use with a rugged "built for touch" design. Its stylish, thin and modern look is coupled with a retail-focused feature set and is an attractive solution for commercial touchmonitor needs. It is well suited for high use public venues where point-of-sale, point-of-information, point-of-service, shelf-level and countertop interactive digital signage and loyalty systems systems are found. Elo 1723L The Elo Touch Solutions 1723L 17-inch touchmonitor is well-suited to meet the durability and aesthetic requirements for a variety of high traffic retail and hospitality interactive solutions and includes options for 3-track Magnetic Stripe Reader (MSR), webcam, RFID reader and brackets for mounting a 0700L rear facing customer display. iTouch Plus zero-bezel multi-touch surface acoustic wave touchscreen technology provides stable "drift-free" operation with outstanding image clarity, resolution, and light transmission-for an accurate touch response and vivid images. iTouch Plus offers a unique, aesthetically-pleasing seamless design and is resistant to water, impacts, scratches and other contaminants on the screen. Elo 1729L The Elo 1729L 17" LCD integrated multifunction touchmonitor is an attractive solution for a variety of applications. Its optional peripherals can easily be integrated into the 1729L's compact design. A choice of up to three of the optional peripherals can be installed including: the magnetic stripe reader, vacuum fluorescent, rear-facing LED customer display, biometric fingerprint recognition device, and speaker bar with or without a built in single or omni-directional barcode scanner. Elo 1915L The 1915L touchmonitor is designed, developed and built to provide the most cost-effective touch solutions for system integrators and VARs. It packs Elo quality and reliability into an integrated, affordable touchmonitor. Elo 1928L The fully featured 1928L touchmonitor offers best in class optical performance mated to the leading touch technologies–IntelliTouch surface acoustical wave and AccuTouch five-wire resistive–along with a combination touch controller, DVI, VGA and built-in speakers. The product can be ordered in beige or gray color, touch and non-touch enabled versions. Elo 0700L The 0700L touchmonitor can be applied as a second, customer-facing display in retail environments and can also be installed as the main display for applications requiring a small screen. End-cap shelf displays in retail settings or as personal gaming screens as part of a larger interactive gaming table benefit from the features and design of the 0700L. Elo 1519L The 1519L is a wide-screen display that is easier to use and incorporate into more environments than traditional desktop touchmonitors. It allows extra content on the screen and is well-suited for corporate environment uses such as spreadsheets, publishing, and dual-window applications. Elo 1919LM The fully featured 1919LM touchmonitor offers best-in-class optical performance mated to leading touch technologies -IntelliTouch surface acoustic wave and AccuTouch five-wire resistive -in addition to a combination USB and serial touch controller, DVI, VGA and built-in speakers. The monitor is available in white, touch and non-touch enabled versions. Elo 1928L The fully featured 1928L touchmonitor offers best-in-class optical performance mated to the medical industry's leading touch technologies–IntelliTouch surface acoustic wave, APR (acoustic pulse recognition), and AccuTouch five-wire resistive–in addition to a combination touch controller, DVI, VGA and built-in speakers. The product can be ordered in beige or gray color, touch and non-touch enabled versions. Elo 2401LM The fully featured 2401LM touchmonitor offers IntelliTouch™ surface acoustic wave (SAW) touchscreen technology which provides stable "drift-free" touch response, outstanding image clarity and full HD resolution, resulting in an accurate touch experience and vivid images. Additionally, the touchmonitor is equipped with industry standard connectivity in the form of a combination USB and RS232 touch controller, DVI-D, VGA connectors and built-in audio amp with stereo speakers. The 2401LM is available in white (P/N E263686) and black (P/N E000140) color. 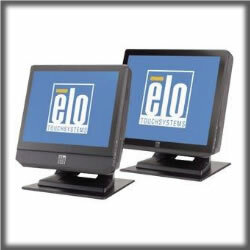 Elo 1247L The Elo Touch Solutions 1247L, a 12-inch open-frame touchmonitor with IntelliTouch touch technology. Gaming and hospitality environments present unique performance and durability requirements for touch screens and the 1247L stands up to the challenge. Elo 1537L Elo chassis LCD monitors have a long-lasting product cycle because the enclosure is controlled by Elo specifications. Future panel improvements are therefore possible without external changes. The 1537L has a compact form factor with thin borders and multiple mounting options for easy integration. Elo 1739L Elo chassis LCD monitors have a long-lasting product cycle because the enclosure is controlled by Elo specifications. Future panel improvements are therefore possible without external changes. The 1739L features a wide viewing angle panel along with a unique, injection-molded minibezel and virtually invisible water-resistant seal. Available with a choice of touch technology including clear glass IntelliTouch surface wave for the utmost in optical quality. Elo 1937L The 1937L open-frame touchmonitor delivers a cost-effective touch solution for OEMs and systems integrators, and complements the expanded family of Elo touch solutions for gaming and amusement, retail self-service and kiosk applications. This compact touchmonitor is "designed for touch," with proven expertise and reliability built-in, not added as an afterthought by altering an existing monitor. Elo 1939L Elo chassis LCD monitors have a long-lasting product cycle because the enclosure is controlled by Elo specifications. Future panel improvements are therefore possible without external changes. The 1939L features a wide viewing angle panel along with a unique, injection-molded minibezel and virtually invisible water-resistant seal. Elo 1541L Elo Touch Solutions 1541L, one of the industry’s first 15-inch open-frame LCD touchmonitors with an LED backlight, that features a 16:9 aspect ratio, suitable for commercial, industrial, gaming and retail applications. The 1541L expands the Elo family of touch solutions for gaming and amusement, information kiosks and self-service with flexible, energy-saving features Elo 1938L The 1938L open-frame touchmonitor delivers a cost-effective touch solution for OEMs and systems integrators, and complements the expanded family of Elo touch solutions for gaming and amusement, retail self-service and kiosk applications. This compact touchmonitor is "designed for touch," with proven expertise and reliability built-in, not added as an afterthought by altering an existing monitor. Elo 1940L Available with either IntelliTouch Plus multi-touch surface acoustic wave touchscreen technology or projected capacitive for a no bezel look, the 1940L provides stable ”drift-free” operation with outstanding image clarity, resolution, and light transmission - for an accurate touch response and vivid images! The 1940L is an ideal solution for many public applications including gift registry, food ordering, airline check-in, DVD and bill-paying kiosks. Elo 2239L The 2239L open-frame touchmonitor delivers a cost-effective touch solution for OEMs and systems integrators, and complements the expanded family of Elo touch solutions for gaming and amusement, retail self-service and kiosk applications. This compact touchmonitor is "designed for touch," with proven expertise and reliability built-in, not added as an afterthought by altering an existing monitor. Elo 2240L Specifically suited for use in high-traffic casino gaming, video-game entertainment and self-service kiosk environments, the 2240L complements Elo's expanded family of touch solutions for casino gaming, amusement and digital signage. The 2240L features a high quality LCD panel with an ultra-wide viewing angle of 178° x 178° horizontal and vertical, which is wider than most other 22" touchmonitors available today. Elo 2242L The Elo TouchSystems 2242L, a 22-inch open-frame touchmonitor with IntelliTouch Plus touch technology provides OEMs and design engineers the ability to develop multi-touch applications compatible with Windows 7 operating system for dynamic, reliable touch-enabled applications including graphically intense kiosk applications such as photo kiosks, gaming, concierge and other guest-engagement hospitality experiences. Elo 2243L The Elo Touch Solutions 2243L open-frame LCD touchmonitor with its slim design and narrow outside dimensions gives kiosk integrators an edge in developing the most aesthetically pleasing products. Wide-aspect displays like the Elo 2243L are easier to use and incorporate than traditional open-frame touchmonitors. Elo 2244L The Elo Touch Solutions 2244L open-frame LCD touchmonitor with its slim design and narrow outside dimensions gives kiosk integrators an edge in developing the most aesthetically pleasing products. Wide-aspect displays like the Elo 2244L are easier to use and incorporate than traditional open-frame touchmonitors. Elo 2740L The Elo Touch Solutions 2740L 27-inch full HD open-frame touchmonitor delivers a professional-grade large format display in a slim, integrated package. The 2740L is designed for use in public environments in applications like information kiosks, ticketing, gaming machines, self-service stations and digital signage. Elo 3239L The 3239L open-frame touchmonitor delivers a cost-effective touch solution for OEMs and systems integrators, and complements the expanded family of Elo touch solutions for gaming and amusement, retail self-service and digital signage applications. This compact touchmonitor is "designed for touch," with proven expertise and reliability built-in, not added as an afterthought by altering an existing monitor. Elo 3243L The Elo Touch Solutions 3243L 32-inch full HD open-frame touchmonitor provides smooth dual-touch performance with IntelliTouch Plus surface acoustic wave technology. The 3243L touchmonitor is 2.3-inches in total thickness and less than 1-inch in border width. The new sleek mechanical design enables thinner and smaller kiosk design for various applications like retail, hotels, gaming, transportation and other commercial uses Elo 2440L The 2440L features a full HD panel available with IntelliTouch, IntelliTouch Plus, iTouch, iTouch Plus, projected capacitive, and non-touch options. Our iTouch surface acoustic wave touchscreen technology and projected capacitive products offer an edge to edge flat glass solution that brings a sleek modern feel to any application. The iTouch products are ideal for vertical implementations, are a lower cost option to projected capacitive technology, and have clear glass for superior optic. Elo B-Series Rev. B The new B-Series Rev.B 15-inch and 17-inch All-in-One touchcomputers continue to bring the same style, flexibility and functionality to point-of-sale, point-of-service, retail and hospitality businesses as the previous version, but now with higher performance and more features. They are designed with the future in mind, allowing easy serviceability of the main components and excellent performance. The fan-less B2 models utilize the latest Intel® 1.86GHz Atom™ Dual-Core N2800 processors, or for higher performance, the fan-cooled B3 models utilize the 3rd Generation Intel Core™ i3 3.3GHz i3-3220 (Ivy Bridge) processors with Intel HD2500 graphics. Elo C-Series Rev. B The new C-Series Rev.B All-in-One touchcomputers continue to bring the same style, flexibility and functionality to high-end point-of-sale (POS), point-of-information (POI), retail and hospitality businesses as the previous versions. The C-Series AiO’s provide highly configurable, ruggedized touchcomputers in two screen sizes: 19-inch and 22-inch, plus the choice of industry leading Elo touchscreen technologies, now featuring iTouch Plus Zero-bezel Multi-touch Surface Acoustic Wave. The C-Series touchcomputer family has been developed to meet the demanding needs of a wide variety of point-of-sale (POS), point-of-information (POI), and point-of-service venues, including retail and hospitality display units, customer loyalty systems, internet access sites and mobile kiosks. Elo D-Series Rev. D The new D-Series Rev.D 15" All-in-One Touchcomputers continue to bring the same style, flexibility and functionality to point-of-sale (POS), retail and hospitality businesses as the previous versions. With a wide array of field-installable peripherals, spill-resistant sealing and a range of input/output port connection options, the D-Series rev.C models are versatile and powerful. They are designed with the future in mind, allowing easy serviceability of the main components and excellent performance. Elo CM-Series The Elo Touch Solutions CM-Series All-in-One touchcomputers for healthcare applications platform leverages the same quality, performance, configurations and design as our popular C-Series touchcomputer. The CM-Series offers bigger, brighter displays in a wide-aspect ratio. This makes the CM-Series an excellent choice for applications requiring a larger display area than traditional touch computers. Particularly desirable for viewing images, including patient characteristics, training and education where high quality visual presentation is required. Elo M-Series VuPoint truly makes healthcare more connected. The integrated communications and computing platform is purpose-built for medical and healthcare environments designed to deliver patient-centric services such as entertainment, information and other services such as electronic medical records. It is a flexible, fully-featured system, with multiple options available to expand its usage and configurations. VuPoint offers a choice of two Intel processors – 1.8GHz Dual Core Atom D525 or 1.1GHz Celeron Dual Core 847E – and multiple connections as well as optional accessories for telephony handsets, and card readers. The fan-less touchcomputer is built to comply with technical standards for the safety, essential performance and effectiveness of medical electrical equipment. A drip-proof, easy-to-clean screen offers protection from drips, leaks, and spills.